Lectures will be held in the Kramer Law Building, Cross Campus Road, Middle Campus. The venues is printed on tickets issued by Webtickets. Venues will also be listed on notice boards in the Kramer Law Building from January 2019. Please note that practical art courses are held at Goldfields Education Centre, Kirstenbosch. Parking is available on Middle Campus in P1, P4, the new Economics Building parking area and in the Bremner Building parking area. Please do not park on verges, pavements or in loading or no-parking zones as the university traffic officers will ticket you. Disabled parking zones are in Cross Campus Road only. To gain access, please present your Summer School registration card and Summer School parking disk. Wheelchair access is on Level 4. ‘Walking disabled’ students should enquire about parking when registering and obtain and clearly display a Summer School disk. To use this facility you are required to complete an application form and submit a recent medical certificate from a medical doctor stating that you are able to drive but cannot walk long distances. Only a limited number of Summer School disabled parking disks are available; these are issued on a first-come first-served basis only for students genuinely in need of disabled parking disks. Students who use municipal parking disks must inform the Summer School office in writing as they also need an additional Summer School parking disk. 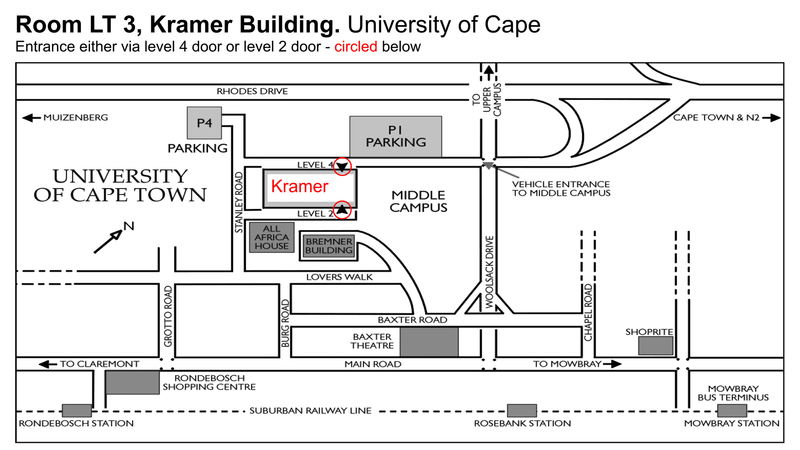 The nearest stop to the Kramer Law Building for the Jammie Shuttle service is the Bremner Building. For information about timetables and routes contact Jammie Shuttle directly at 021 650 5289 as the service is limited during the university vacation. University buildings are generally accessible to disabled students. Nearly all our venues are wheelchair accessible. Wheelchair accessible toilets are on Level 4 of the building. There is lift access to all levels of the Kramer Building. Please contact us to discuss the easiest access route. Thefts occasionally occur from cars and from unattended bags. Please lock vehicles securely and keep your possessions with you. Parking areas are regularly patrolled by campus security officers. If you lose something, contact Campus Protection Services on Level 1. Telephone: 021 650 2121. Please note that smoking is not allowed indoors on UCT campus. Please turn off cell phones before entering the lecture venues. The air conditioning in the lecture theatres unfortunately cannot be internally adjusted and is sometimes quite cool; please bring warm clothing with you. Unless otherwise specified lectures are about 60 minutes in length, including questions from the audience. Please do not hold seats for other participants. If you have not taken up your seat five minutes before the lecture begins, your seat may be sold. Please obtain the lecturer’s permission before recording lectures. Lecturers are asked to recommend readings available locally but we cannot guarantee this. Handouts may be given free or sold at cost. Summer School students may use the reading facilities in the Chancellor Oppenheimer Library on Upper Campus. Please show your Summer School registration card and sign the visitors’ register at the reception desk. Where possible recommended books and journals will be made available and may be on display. However, it is not permissible to take material out of the library. Photocopies may be made by using a non-refundable card purchased for R25,00 from the Loans Desk in the library. The Brand van Zyl Law Library in the Kramer Building is a specialist library used by postgraduate law students, particularly in January, and is not accessible to Summer School students. UCT’s Educare Centre on Upper Campus provides childcare for children from three months to five years of age. Contact Marilyn Petersen-Sanders at 021 650 3522 for further information. The Kramer Cafeteria offers teas, snacks and lunches from 7.30 am to 8.00 pm (Mondays to Fridays). A small evening menu will be available from 5.30 to 8.00 pm. Revelations, situated in the new Economics Building, Middle Campus, offers delicious, healthy and original food from 7.30 am to 4.30 pm (Mondays to Fridays). UCT Club, Sports Centre, Upper Campus, is fully licensed and open for meals from 12 noon to 2.30 pm and from 5.00 to 8.00 pm (Mondays to Fridays). Contact UCT Vacation Office directly at 021 650 1050, fax 021 685 2629 or email vac-accom@uct.ac.za, indicating that you are a Summer School student. The Summer School office cannot provide information on university accommodation. There is no charge for joining or for corrections to the mailing list. Please notify us should your address or contact details change. All Summer School information is available on our website: Students who live overseas are charged R30,00 for postage. Extra brochures may be obtained from the Summer School office at a cost of R10,00. A pdf of the brochure may be downloaded here.